T’internet has let me down. I was hoping to find a convincingly authoritative site about the psychology behind toddlers’ drawings and/or colour associations. Nothing... Come on hippy, psycho-babbler bloggers, get with it. It’s all because of two-year-old Alpha Blondie’s drawings this week. I should really say ‘portraits’ rather than drawings - the kid made me pose for them. I froze. This is all new for Alphie, one of those sudden developments that signals a new door opening in the brain: yesterday - he scribbled, today - he represents what he sees. Over and over again, he draws Mummy with dozens of legs and even more eyes. For the most part, I am brown. Then he gets another piece of paper and draws an orange blob, which is Mummy, then a purple blob for himself and a yellow blob for his big sister. Daddy is blue. He inspects it for a while and then says, ‘No,’ and changes the Mummy blob from orange to brown. So I am definitely brown. ‘Dere!’ Now he is satisfied and it goes on the wall. 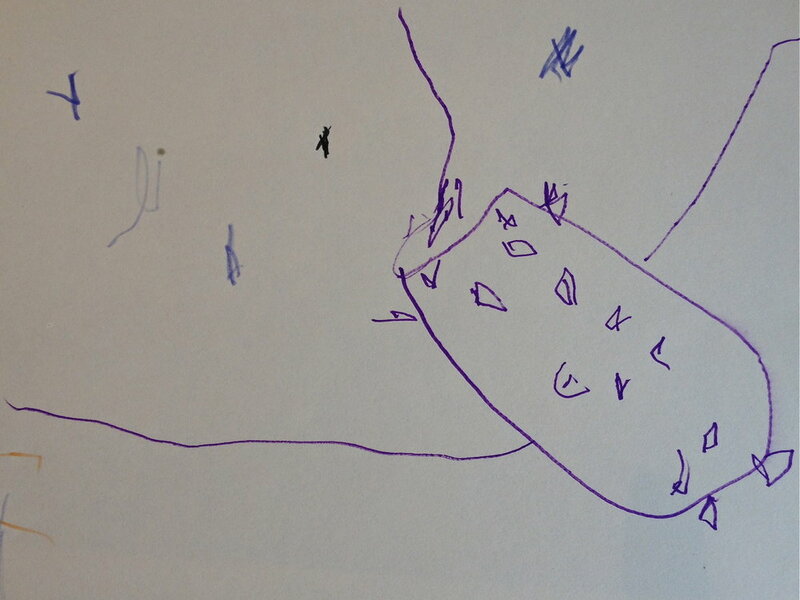 Finally, he draws our house with lots of windows and some blue blobs, which he explains are bats. Alphie is scared of bats. He looks at his picture for a long time, then draws two lines coming out of the house. ‘What are the lines?’ I ask him. ‘Arms,’ he says. My analytical brain goes into overdrive. Are the arms active - shooing away the bats? Are they representative - protective arms, suggesting that he feels safe in the house? Or is he just two and hasn't noticed that houses don't have arms? I feel he’s speaking a new language. But what is he saying?